A MOTORCYCLIST has been left with life-changing injuries following a collision with a car near Chichester. 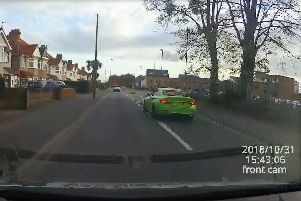 The black KTM Super Duke was travelling south on the A285 at Duncton, when it collided with an oncoming blue Nissan Juke at about 10.30am on Monday. The motorcyclist, a 53-year-old man from Northolt in London, was airlifted to Royal Sussex County Hospital in Brighton but his injuries were not thought to be life-threatening. The occupants of the Nissan, a 35-year-old man, a 40-year-old woman and a five-year-old girl, all from Seaham in County Durham, suffered minor injuries. A section of the A285 was closed for about three hours following the incident. Anyone who saw what happened, or who saw either vehicle in the area prior to the collision, is asked to contact Sussex Police by emailing collision.appeal@sussex.pnn.police.uk. People can also phone police on 101, quoting Operation Montgomery.